When in 1966 Jones, dubbed Mack the Knife2, galloped out to center field in Atlanta Stadium, fans of the brand-new Atlanta Braves hoped he would reinforce the aging bats of Eddie Mathews and Hank Aaron. His 31 home runs for Milwaukee the season before had given them reason for that hope. Mack Fletcher Jones was born to Georgia natives Mack and Inell (Willis) Jones on November 6, 1938. (He was their only child together; Mack Sr. had two children from a previous marriage).3 Mack Sr. and his wife, 13 years his junior, scraped out a living together near the Chattahoochee River as a construction laborer and maid, respectively. Their children attended Henry McNeal Turner High School in Atlanta, where Mack developed a sterling reputation in sports, becoming, among other things, an all-state halfback. The racism he encountered then, and later in his life, is reflected in his remark that he “had scholarship offers from just about every [African-American] college in the country.”4 Apparently no other colleges would consider this multi-talented athlete. At any rate, it was baseball that had the greater allure. In 1960 Jones was promoted to the Louisville Colonels of the Triple-A American Association, where he was teamed with Maye until the latter was called up to Milwaukee. Mack’s superb season was capped by a late-season 19-game hitting streak that propelled him and the team to a Junior World Series triumph over the International League’s Toronto Maple Leafs. That winter Milwaukee traded longtime center-field stalwart Bill Bruton to the Detroit Tigers with the expectation that a replacement would be found among a vast number of prospects. When Jones received the starting nod in the first exhibition game the following spring, it provided a clear indication of the esteem in which the 22-year-old lefty slugger was held. But a poor Grapefruit League campaign resulted in a return to Louisville, setting in motion a pattern that exhibited itself over the next three seasons. Jones’s home-run total, combined with those of five other Braves, set a National League record for the most teammates (dubbed Milwaukee’s version of Murderers’ Row) with 20 or more. (The 2003 Atlanta Braves tied this record.) 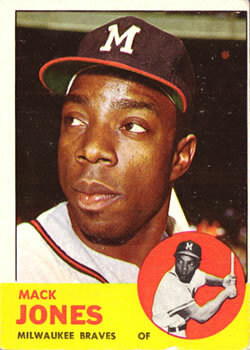 In addition, Mack was one of three Braves slugging 30 or more round-trippers, tying a major-league mark. (His 30-plus home runs were matched by nine other NL players in 1965, marking the first time 10 National Leaguers attained the 30-homer level in the same season. Among this select company, and with his first full season behind him, Jones appeared to have permanently arrived in the major leagues. The 1965 season was played in the shadow of one overriding reality — it would be the last of the Braves’ 13 seasons in Milwaukee. A pending move to Atlanta was met with player reaction ranging from ambivalence to deepest sorrow, but for one — Mack Jones — the thought of wearing the name of his hometown across his chest was met with sheer excitement. The community was similarly enthralled and Mack became a local celebrity. An Atlanta radio station catering to an African-American audience contracted with him for a series of sports broadcasts, and the Braves made him part of their winter caravan (where his humor was oft cited) to solicit season-ticket holders from the same audience. The buzz brought Mack to exclaim, “I think this [move to Atlanta] is going to be the greatest break in my life.”12 But elation was soon tempered by an injury that affected the remainder of his playing career. Though Jones felt discomfort in his right shoulder from the outset of spring training in 1966, he and the team doctor felt it would subside. Instead, the pain got progressively worse and, on the day before the season began, he underwent an operation to remove a nickel-sized bone chip. The timing could not have been worse. The personal angst was palpable as Jones was forced to watch while his teammates took the field on April 12 for the first major-league game in his hometown. He returned to the lineup on May 14 in St. Louis only to be forced to leave the game early the next day after being hit in the head by a Gibson fastball, and miss the next two games entirely. On May 20 he celebrated his first game in Atlanta with two home runs, and slugged seven round-trippers in his first 22 games. Bragan credited his return for the team’s surge in June, and called Jones, Aaron, Carty, and Alou “the best composite outfield in the game.”13 Mack’s seven home runs and 17 RBIs in his final 28 games helped the team close on a strong note and set great expectations for the next season. The misfortunes that befell Jones in 1967 are perhaps best exemplified by the events of April 16, when he was struck by a first-inning pitch from the Dodgers’ Don Drysdale, then was hit again during a pickoff play at first and had to be removed for a pinch-runner. The Braves had spent the winter fending off trade inquiries for Jones– including an aggressive offer from the Chicago White Sox — and his promising start (.300 in his first 20 at-bats) seemingly confirmed the team’s decision to hold on to their prized slugger. But another strong close to the season (.342 in his final 79 at-bats) only served to mask the difficulties he encountered in between. After 16 games Jones was batting.189, and he had a horrific five-game stretch in mid-June when he struck out in 13 of 20 at-bats. Even the heavens appeared to conspire against him. On June 29 in Atlanta, after batting.296 with seven RBIs in nine games, he drove in four runs with a home run and a double against Houston, but a heavy rain washed out the game, along with that day’s statistics, in the top of the fourth inning. Suspicions that the 1966 operation was affecting Jones’s play — he later admitted that the shoulder “never was fixed right”14 — became evident when manager Billy Hitchcock (who’d replaced Bragan during the preceding year) explained his reasons for shifting Mack from center field to left in August of 1967: “[W]e kept hoping that Jones’ throwing arm would come around. But it hasn’t. Runners have been taking the extra base on Mack. … It could be that because Mack thinks he hasn’t done the job on defense, it has affected his hitting. Perhaps this move will ease the pressure.”15 The shift may indeed have contributed to his strong finish, but Mack’s season-long output was a mere shadow of the preceding year. 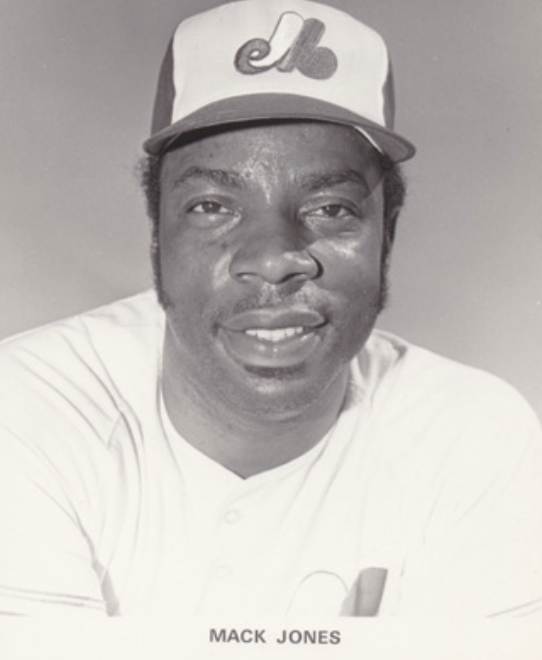 Jones was projected as the Expos’ center fielder, but the arm problems that followed him north forced a move to left field. Still, he smacked the first home run hit on Canadian soil, and became a fan favorite. (Jarry Park’s grandstand and bleacher area abutting Mack’s perch in left was christened Jonesville. He sported a .373-7-26 line 30 days into the season, and the baseball-hungry Montreal fans offered standing ovations the moment Mack emerged from the dugout. “Never have I seen a man applauded for a strikeout,” said Expos manager Gene Mauch after just such an occasion.18 He hit his 100th career home run on May 9 and followed with his second career grand slam the next day. (He hit another on July 26 in Atlanta.) He was bypassed in favor of Rusty Staub as Montreal’s sole All-Star Game representative, and despite a severe slump (.187 with only one homer during a 26-game stretch), he still finished among the team leaders in every offensive category. The only cloud that marred Jones’s fine season was the challenge that every African-American encountered — the unsightly face of racism. On a road trip to Houston in mid-May, Mack’s ire was raised when an unruly fan used a contemptuous racial epithet. “Any time I hear that filthy word, my reaction is violent,” said Jones.19 Tempers cooled and the game proceeded, but one wonders if the words from his high school’s namesake before the Georgia House of Representative in 1868 — “[a]m I a man? If I am such, I claim the rights of a man” — may have echoed through Mack’s strong reaction. Though Jones spent two more seasons with the Expos, he did not regain the success of his debut campaign. He never fully recovered from a slow start in 1970 that relegated him to pinch-hitting duties, and before long the moniker Mayor of Jonesville became a distant memory to the fans in Montreal. Before the 1971 season the team rejected trade inquiries in hopes that the preceding season was merely an anomaly. Hitting coach Larry Doby worked closely with Mack in Florida. Jones was the Opening Day starter in left field but returned to the bench after going hitless in his first four games, and was used sparingly thereafter. An unsuccessful pinch-hit at-bat on July 1 against Atlanta dropped his batting average to .165 and represented his last appearance in the major leagues. He was released seven days later. Mauch’s comments reflected the feelings of fans and teammates alike: “This is one of the saddest days since the Expos were born. I hate to see Mac[k] leave us.”20 In 1,002 major-league games and 3,091 at-bats, Jones collected 133 home runs and 415 RBIs to accompany a .252 batting average. His hit-by-pitch total of 77 placed him among the career top 200 (as of 2014). Jones returned to Atlanta and resumed his offseason career in insurance. He dedicated much time coaching youth baseball and football, and this avid fan could often be found in front of a television watching sports. In 1998 he was one of six players (including Hall of Famer Grover Cleveland Alexander) honored as inaugural inductees in the Syracuse Chiefs’ Baseball Wall of Fame. Jones joined five others — including Hall of Famer Grover Cleveland “Pete” Alexander — in the first induction class. He was inducted into the International League Hall of Fame in 2013. Mack Jones was diagnosed with stomach cancer in October 2003 and succumbed to the disease on June 8, 2004, at age 65. He was survived by his second wife of 30 years, Esther; two children; two stepchildren; and three grandchildren. His only son, Rontae, apparently inherited some of Mack’s athleticism — at various times he had tryouts the Braves, Expos, and Florida Marlins. The author wishes to thank Mack Jones’s widow, Esther, and son, Rontae, for their time and assistance in ensuring the accuracy of this narrative. Further thanks are extended to Terry Sloope, Bill Nowlin, Len Levin, and Russ Lake for their editorial and fact-checking assistance. Thanks as well to Rontae Jones and Esther Jones for telephone interviews on September 9, 2013, and to Rontae Jones for email correspondence on September 12, 2013. 1 “Vet Covington and Rookie Jones Run 1-2 in Tepee Picket Derby,” The Sporting News, January 18, 1961: 12. 2 Jones’s nickname “Mack the Knife” was a reflection of the popular 1959 hit song by recording artist Bobby Darin. Other athletes of the era with the same first name — Kuykendall (minor-league baseball), Herndon (college basketball), and Herron (football) — were all similarly tagged. 3 1940 Census records refer to Inell as “Snellen.” Conversations between surviving members of the Jones family and the author suggest her first name was Inell. 4 “Mack Likes New Scenery in Cincy,” The Sporting News, February 10, 1968: 35. 5 “Dressen, Taking Over, Charts Busier Summer for Papooses,” The Sporting News, December 30, 1959: 15. 6 “Bell’s Busy Bat Helps to Calm Storm in Tepee,” The Sporting News, June 23, 1962: 19. 7 “Bragan to Continue Platooning Strategy,” The Sporting News, February 15, 1964: 8. 8 The Braves sent Mack to the Detroit Tigers for outfielder Purnal Goldy, although each team retained the rights to their original player. See The Sporting News, November 28, 1964: 7. 9 “Chiefs’ Jones, Northrup Hit Chuckers With HR Arrows,” The Sporting News, August 15, 1964: 29. 10 “Braves Drill on Assembly Line; Squad Broken Up Into 3 Shifts,” The Sporting News, March 6, 1965: 23. 11 “Braves’ Eyes Flash and Crackle as Jones Turns on the Juice,” The Sporting News, September 18, 1965: 16. 12 “Atlanta Togs Fit Perfectly, Jones Beams,” The Sporting News, December 11, 1965: 23. 13 “Braves’ Garden Best, Bragan Boasts,” The Sporting News, July 23, 1966: 21. 14 “Stoneman Aiming to Soften Batter With New Pitches,” The Sporting News, March 28, 1970: 29. 15 “Aaron Moves to Center In Tepee Picket Switch,” The Sporting News, August 26, 1967: 29. 16 “Mack Likes New Scenery in Cincy,” The Sporting News, February 10, 1968: 35. 17 “Draft Blows Fog Over Cardenas’ Future,” The Sporting News, November 2, 1968: 34. 18 “Raps at Playing Surface Annoy Expos,” The Sporting News, May 3, 1969: 20. 19 “Robertson Turns Ignition as Starter for Expos,” The Sporting News, June 7, 1969: 23. 20 “Mike Marshall No Longer Hero in Montreal,” The Sporting News, July 24, 1971: 24. 21 “Maye, Jones Out Front in Picket Race,” The Sporting News, March 16, 1963: 23.